This Quinoa Vegetable Salad is packed with protein and flavor and full of all the colors of the rainbow. It’s perfect for packing. I’ve been eating a lot of salads lately. When my kids were little, a big salad was my daily lunch. Over the years of penny pinching and such, I’ve gravitated toward eating up leftovers to save time and money. And usually leftovers aren’t so bad around here, so it’s a good thing. However, I know that I can keep my weight in (better) check when I eat an abundance of salads. The best way for me to pull this off is to make several salads at one time. Not only does this bulk salad making make it quick and easy to serve myself a yummy, healthy lunch, but because they’re already made and therefore, kinda count as “leftovers”, I know that I will eat them. Waste not, want not. Am I right? This Quinoa Vegetable Salad is one of my new favorite salads. It’s meatless, but it’s packed with protein from the quinoa and garbanzo beans. Add a healthy, fatty avocado and a Dijon vinaigrette and you are in business. I like to pack salads and lunches on the go in these BPA-free reusable containers. I’ve bought a few sets so far for my husband’s and my lunches. They are durable enough to reuse, but cheap enough that I don’t mind if one gets left behind somewhere. Plus, they look cool, like I got my lunch from a fancy restaurant, right? I’ve made bulk batches of Quinoa Vegetable Salad up to five days in advance, provided the spinach is really fresh and dry, and they’ve been just as good on the last day as they were on the first. You can add chicken, steak, tuna, or even some shredded or crumbled cheeses, but I like them just as well all vegan. Who knew I would ever say that? This recipe will make five hefty lunch size portions or one large bowl to serve a crowd as a side salad. It doesn’t taste overly “healthy” but it is good for you! Yay! In a large sauce pot with a lid, bring 1 1/2 cups water to a boil. Add the quinoa, reduce the heat to simmer, and cover, cooking for 15 minutes, or until all the water is absorbed. Remove from heat. Place a paper towel under the lid and allow the pot to sit for an additional 12 minutes. Remove the paper towel and fluff the quinoa with a fork. Allow to cool to room temperature. 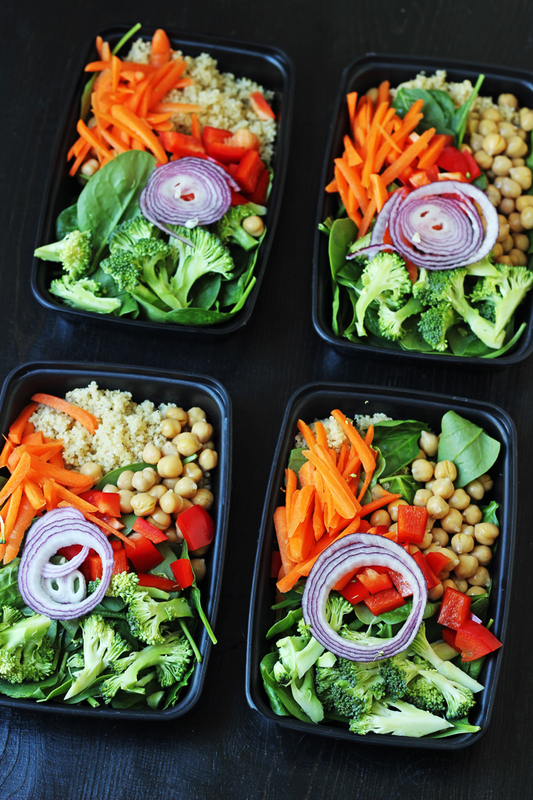 If you are preparing the salad as individual meal salads, lay out five plastic dishes. 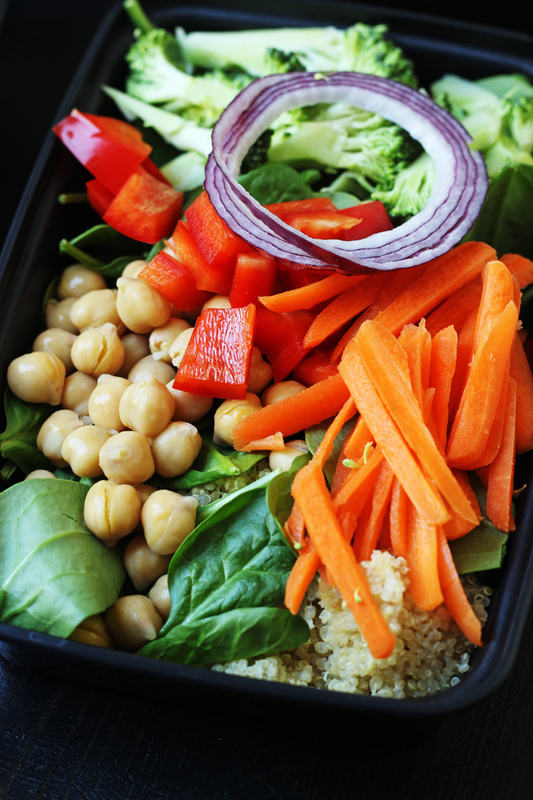 Divide the quinoa, spinach, beans, pepper, carrots, broccoli, and onion among the five dishes. Cover and refrigerate until serving time. If you are serving this all at one time, simply assemble all the salad ingredients in a large salad bowl. Either way, add the avocado right before serving. In a small bowl, place the spoonful of mustard. Add the vinegar and stir until well blended. Season with salt and pepper to taste. Slowly whisk in the olive oil. The mixture will be quite thick and emulsified. Serve the salads with the dressing on the side or if you prefer, you can toss the large salad bowl with enough dressing to coat. Looks delish! I have these containers and love them! Aren’t they great? I’m actually running out. I wonder if my husband has a stash at work…. This looks very tasty! You cut the carrots the same way I do. ? I really need to drop some weight but I fall into the trap of eating the leftovers for frugality and a mental condition that won’t allow me to “waste” food. I think I could do this. It goes to waste or it goes to waist. That’s my motto. It’s hard not to make too much. I feel you. Thanks for the recommendation on the quinoa! Does this not taste bitter? I actually just recently threw away some cooked quinoa and all that was left in the package because I did not like how it tasted even with rinsing. I saw the Bob’s Red Mill on the shelf at my local store but was put off by the high price – didn’t want to take the chance. Your recommendation is helpful – and timely. 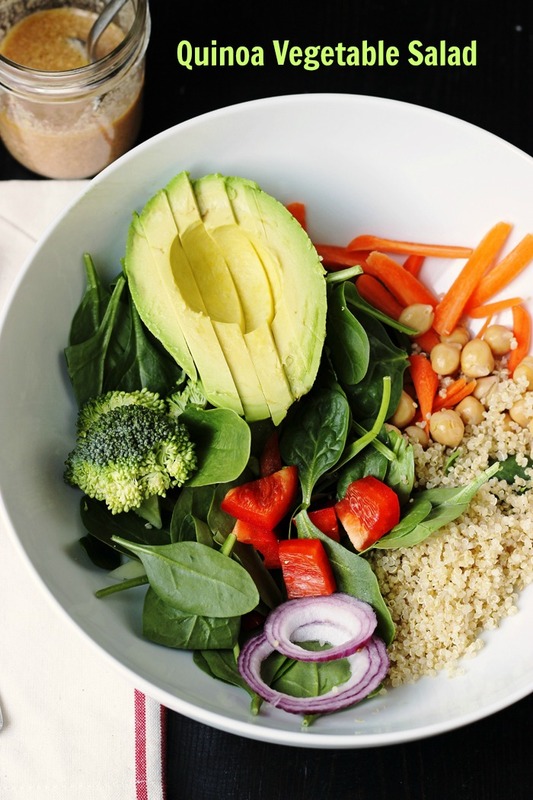 This salad looks yummy, too. I only buy Bob’s Red Mill for that very reason. I have never noticed a bitter taste. It isn’t cheap, but it makes me like quinoa.